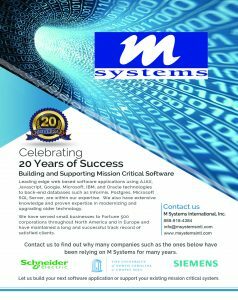 20th anniversary - M Systems International, Inc. 20th anniversary - M Systems International, Inc.
2016 is our anniversary year! 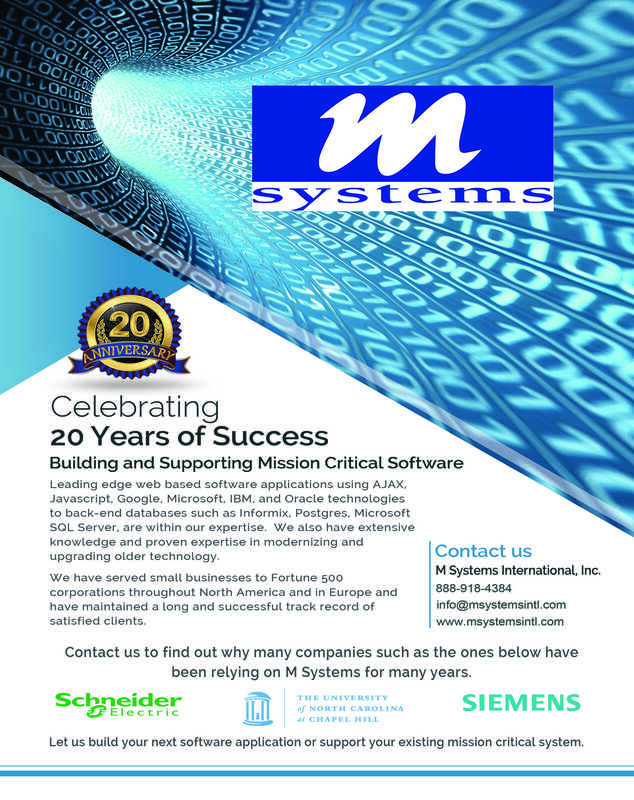 M Systems is celebrating our 20th year in business. Almost all our customers that we started serving at some point during these past 20 years are still with us, and we work hard every day to continue to earn their business. While continuing work and deliveries on several critical web-based system development and support engagements, we are adding key customers and projects to our portfolio. Technology modernization and upgrade projects involving Informix, Informix-4GL, C, Genero for mission-critical systems in the steel industry and a large workers union were recently made possible by M Systems’ expertise in Informix technology. M Systems teams are working on development and support engagements in industries as varied as manufacturing, engineering, finance, reinsurance, cattle breeding/animal genetics, professional sports, worker unions, and education. M Systems continues to add to its capabilities in developing enterprise grade web based solutions and continues to prove its success by delivering systems that work. For web-based platforms, our leading platform is the Google Web Toolkit (GWT) technology, the same technology used by Google in their products including Gmail and Google Earth. We also continue to remain actively involved in Microsoft technologies such as .NET and SQL Server.